Based on our quick MTB review at Interbike’s Dirt Demo, we have been extended a Marin mountain bike demo for a long term review. This week, a big brown box showed up at our office. What was inside was a Marin B-17, a full suspension trail bike just waiting for me to put together and ride. However, before I ride it and give you a full MTB review let me share with you what is actually coming out of that box. The first thing I have to note about this bike, is that it isn’t a brand new bike. While it’s new to me, It has been to a few demos before. That being said, I have to note the immaculate condition this bike it arrived in. Whereas the tires show signs of wear the frame and components were cleaned to a level I have never seen before. Overall, the bike built up quickly and easily for a quick spin around the block. The Marin B-17 2 in all its glory. It won’t be so clean soon. 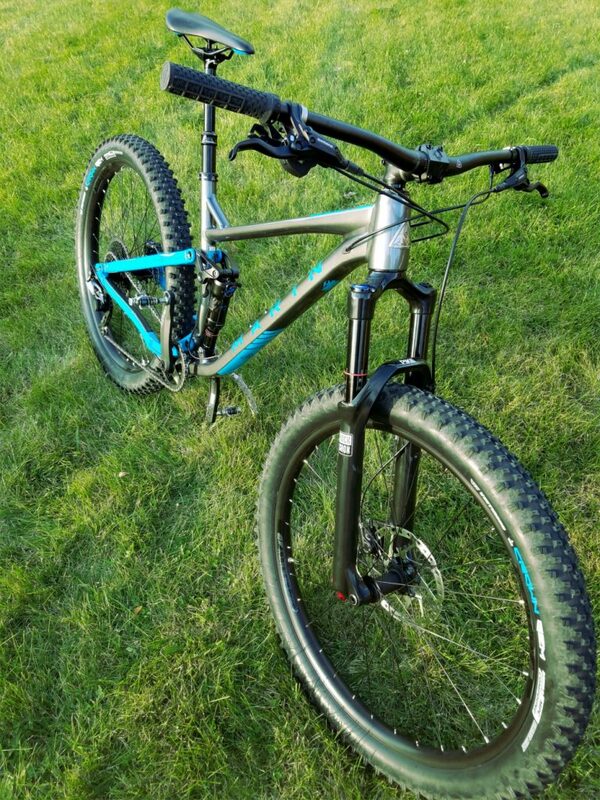 The B-17 is an aluminum trail bike that uses Marin’s MultiTrac suspension system for 120mm of travel. The MultiTrac system is tuned to absorb large and small hits equally, while still maintaining pedaling efficiency. 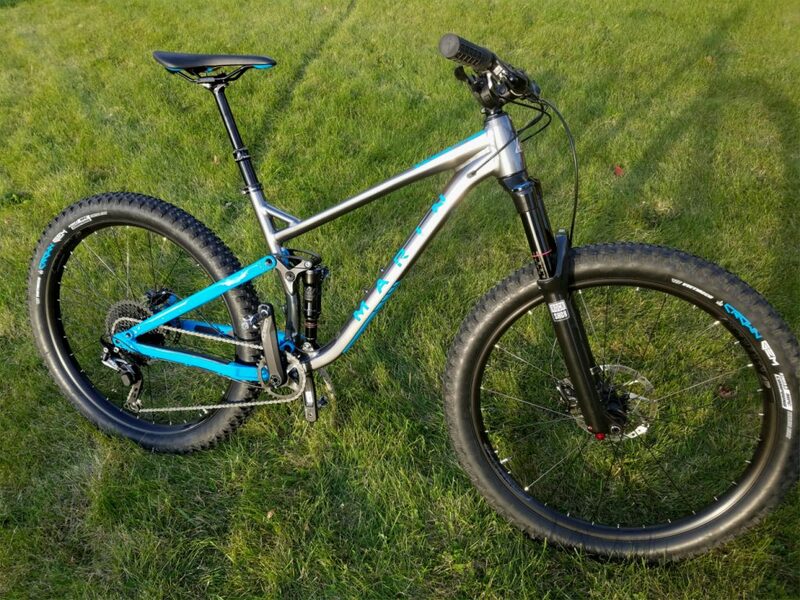 It accepts both 27.5” x 2.8” wheels as well as standard 29” wheels. On first inspection, the frame design is clean, with the cables running internally within the frame. The rear shock is tucked neatly in line with the seat tube allowing for the use of a normal water bottle cage. For additional stand over clearance, the Top tube is welded low on the seat tube and uses a jack brace for strength. Overall, the B-17 frame looks like someone sweat all the details. Here you can clearly see the cables enter the frame. Also, take a look at how each tube is shaped specifically shaped to its intended purpose. The version of the B-17 I am riding is an early production demo unit. For that reason, the parts are slightly different from the final retail bike. Most notably, my demo unit uses a Rockshox Pike rather than the Rockshox Revalation suspension fork. For the most part the two forks will ride similarly, with the Pike being a bit smoother in operation. The rest of the bike uses Shimano parts for shifting (SLX) and brakes, which ensures great shifting and stopping. This model B-17 also uses a dropper seatpost, to let me get my weight back and low on the trail. 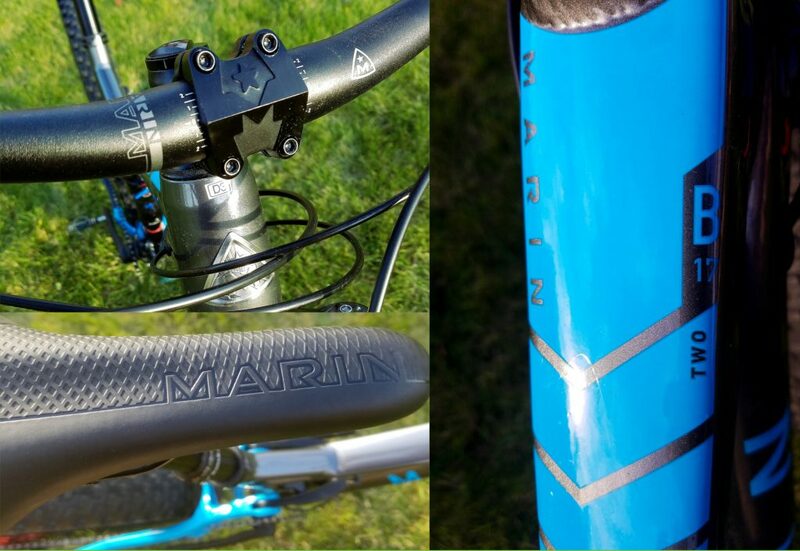 Throughout the rest of the bike, Marin uses house brand components for the rims, bar and stem. While this may have been an area of concern in the past, most brands are sourcing some exceptional parts. Any remarks of the house brand components would be incomplete if I didn’t remark on how well Marin has tied these products into the rest of the bike. The same graphic touches that make the frame look classy are carried through to the parts. The graphic are clean and understated, without overstating the bicycles brand name. I really want to see if this bike handles as well on my home trails as it did in Las Vegas. Our parks have limited climbing and smooth features, so it will be interesting to see if the plus sized tires have the same dominance on these trails as they did in the steep, rocky terrain of Nevada. Finally, I can’t wait to really tune the suspension and see what it is capable of. Stay tuned for the long term review in the next few weeks. 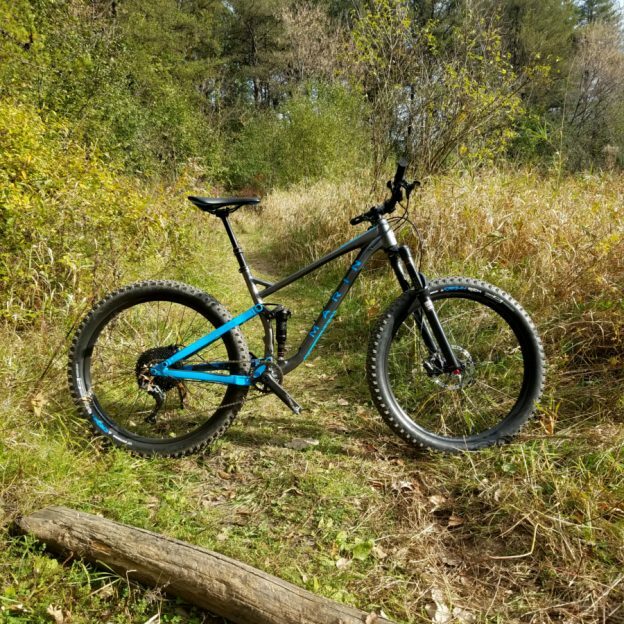 This entry was posted in News and tagged #shimano, B-17 review, B17 review, full suspension, HaveFunBiking, Marin B-17, Marin Bicycles, Marin Bicycles B-17, Marin bikes, Marin Bikes B-17, MArin review, Minnesota Bike/Hike Guide, MN trails, MORC, mountain bike, Mountain Biking, mountain biking fun, Pike, Revalation, Ride My Bicycle, Ride My Bike, Rock Shox, Rockshox, Shimano SLX, SLX on October 26, 2017 by John Brown.